This location provides a premium office experience that allows for any business to thrive. This location strives to provide its guest with top notch services and amenities. This office creates an ideal turnkey atmosphere that sets it apart from its competitors. With flexible leasing terms and furnished office suites, this location works to provide each client with the essential tools needed for success. Come and settle into Burlington’s elite Burloak Business Park located just off Queen Elizabeth Way. A remarkable collection of luxurious furnished executive suites awaits, featuring modern conferencing facilities and complimentary onsite parking. World-renowned downtown Toronto is just minutes’ away. Locally owned and operated this Burlington centre provides 10,000 sq. ft. of fully furnished office space and meeting rooms with a variety of layouts to suit individuals, small and larger businesses alike. A partnership with HostPapa, Canada’s largest independent web hosting and cloud services provider, allows the centre to effortlessly meet even the most sophisticated technology needs of members. The free Wifi and wired Internet is lightning fast and the website builder tools, email, and web hosting plans included with private office memberships will help you take your business to the next level. 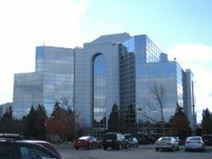 This professional business center provides executive and premium office space set within a highly prestigious corporate base near to the heart of Canada"s so-called Golden Horseshoe and is the perfect location for this striking and recognisable building to host exquisite and great value workspace provision. Surrounded by attractive landscaping on all sides and a number of high quality local amenities, the flexible office space is perfect for start-ups or trial locations as well as well established and larger companies.